Welcome to my home page! My name is Dennis Lee Shaw and I'm glad you decided to visit me. I keep saying "it can't get any better than this" and yet somehow, but the grace of God, every year gets better than this. "Don't try and change the world. If you do, you will get frustrated and not change anything. Instead, 'make a difference' in everything you get involved with. If we are all successful in making a difference in our little corner of the world, together we will change it!" I have worked at UW-Stout, Wisconsin's Polytechnic University and the nation's first institutional recipient of the prestigious Malcolm Baldrige Quality Award. I was hired in March 1993 as Police Chief and accepted promotion in 1999 to the position of Asstant to Assistant Vice Chancellor for Student Life Services (initially titled Assistant Executive Director of Student Life Services before my boss was name an Assistant VC). In addition, I served three years as Chair of the Senate of Academic Staff, one of three governance groups on campus. This experience has been especially rewarding to me as it has given me an opportunity to further expand collaborative relationships with faculty, staff, students, alumni and outside stakeholders. I really enjoyed working closely with the top leadership of UW-Stout (Chancellor Sorensen, Provost Furst-Bowe, Vice Chancellor Moen, and the Chairs of the faculty and student senates) to move the university forward! It also gave me an opportunity to serve on Regent committees and on the Academic Staff Reps Council (which I had the honor to chair in my final yaer on ASRC). It was great to work with President Reilly, Sr VP Martin and all the System staff. We have a great 26 campus system in the University of Wisconsin. Maybe the finest in the country! I believe everyone should know their ethnic heritage! I have the honor of representing the Clan Shaw Society, a Scottish family heritage society. 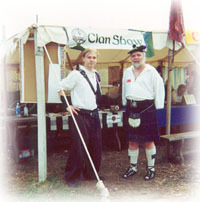 Lisa and I serve as Co-Conveners for the states of Wisconsin and Minnesota, so it is possible you have seen us at area Highland Games and other events for the Scottish Community. 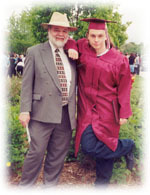 I also was Convener for Iowa until 2002 when Michael Shaw (no, not my son) accepted that post. In this role we go to various scottish heritage events and set up a tent where people can come and find out more about the Scottish Shaws (or other scottish clan families). In addition, I served for one year on the Board of Directors of the Minnesota Coalition of Scottish Clans. The Clan Shaw Society has been very good to me naming me as Clansman of the year (2000), to the Order of the Dagger (2005), and I was informed in December 2009 that I was being installed into the Order of the Dirk. I am truely honored! Discovering something about your family history is fun. I encourage everyone to delve into it. And, if you are in the area, stop into one of the events we participate in and say hello. We'll show you some of our wedding photos (complete with the guys in kilts, a piper, and kilt christening ceremony). 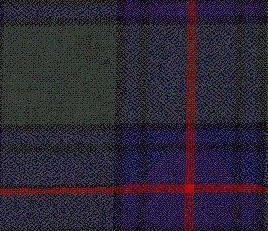 If you are not a Shaw but have some Scot in you, we can probably show you your family tartan. What kind of person would I be if I didn't also mention my friends and family? As you all should know, I am now married to Lisa Shaw (formerly Erickson - if you met her at a Highland Games I likely introduced her as Lisa MacErickson). We want to thank everyone who shared our special day with us! My son Mike lives in Menomonie. He was a student at Stout (as well as joining me at an occasional Highland Games for the Clan Shaw Society). As most of you know, I was actively involved in politics. I was the Chairman of the Third Congressional District Republican Party in Wisconsin from 2001-2005 and served as the Chair of the Party Development and Convention Subcommittees for the Republican Party of Wisconsin. I am also a past Chairman of the Dunn County Republican Party. I enjoyed telling people in 2004 that I went to the election party at the White House (which was true in a sense as my wife and I attended a party for our congressional candidate at the White House Hotel and Conference Center in Richland Center, WI-I still chuckle at that)! But seriously, I had several honors during my time in Wisconsin Republican politics. 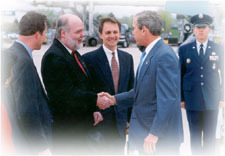 First was being allowed to greet President Bush when he arrived in Air Force One in La Crosse in 2002. Second was attending the National Republican Convention in NY in 2004 (a boyhood dream fulfilled). And third was being named the second recipient ever of the Tommy G. Thompson Award for grassroots activism. And fourth, was that I served as one of the ten Bush electors to the Electorial College after the 2004 presidential election. I encourage everyone to take an interest in politics, vote for the person who most closely matches your beliefs, and let your elected officials at all levels, from local, to county, to state, to federal, know how you feel about the issues. They are (or at least should be) your servants! The big thing in my personal life not already covered above, is that I decided to go back to school and earn my doctorate degree. I've always considered myself a life-long learner so I always knew that someday I would do it. But, while serving in my campus governance position, and dealing with the global issues at a university campus, it awoke a calling within me to seek an upper management position at a university (hopefully within the UW System!). To successfully compete for such a position, I need my terminal degree! As a former police chief, I always said that if I went back to school it would be to get my law degree. So in 2008 I enrolled in the Taft Law School of the William Howard Taft University in Santa Ana, CA. It's an online program which allows me to study during my free time, but it is very challenging. Taft Law School is one only two online law degree programs that are accredited though an accrediting body recognized by the US Department of Education (and for me to use the degree to move up in Higher Education it is critical that it be accredited!). Obviously I am or have been closely associated with several other organizations. For instance, I am a 1993 & 1994 graduate of the Collegiate Management Institute (CMI) program and have the pleasure of serving as Advisor for Level II for 4 years starting in 2001. It truely is the program that builds leaders! I believe in giving back to the community I live in and therefore am active in the local community. I am a member of the Menomonie Alliance Church. My faith gets stronger every day thanks in large part to of Pastor Jack's sermons and the other programs at MAC such as Alpha. I'm a member of the Rotary Club of Menomonie. I am particularly proud that the Club Historian/Archives Committee that I chair produced a digital CD of the club activities for the past 3 years. As far as I can tell its a first for the District 6250! I have also had the honor of being asked to serve as member of the Ambassadorial Scholarship Committee for RI District 6250 in 2008. I currently serve on the Peer Review Corps for the Academic Quality Improvement Program (AQIP) of the Higher Learning Commission - North Central Association of Colleges and Schools. Not only is this an opportunity for me to "make a difference" by assisting campuses through the critical accreditation process, but I learn things that hopefully I can bring back to make my campus better in the process! I was a founding Board Member and Officer of the Oaklawn Harmony Centre Board. We were trying to build a building to house a number of non-profit organizations. Here is a link to a story about the group (see Page 2). I was also Board President of the Bridge to Hope, local sexual assault and domestic abuse agency. While I was President we finally opened the shelter! I have always be active in professional organizations. I am a board member of the Academic Staff Professionals Representation Organization. ASPRO is not a union but lobbies for the professional staff in the university system. For the past several years I have served as Board Vice President. 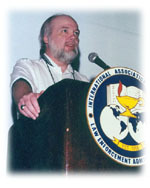 I currently hold membership in Association for Student Conduct Administration (ASCA) and was also a long-time member of the International Association of College Law Enforcement Administrators (IACLEA) serving as past president of the Wisconsin Chapter and Chair of the Technology Committee for the Intermnational Organization. I should also say that I was a martial artist. I earned my Purple Belt in American Style Karate from Karate American. They were a group in Eau Claire where Mike study karate. I told Mr. K if he opened a place in Menomonie (and I helped him find it) that I would be his first student to sign up. It was great but I stopped when I broke my foot doing a jump spin kick on my purple belt test (but even with a broken foot I continued and earned my belt!). Well that's it for now. Thanks for visiting!